Yeovil Town have signed Portsmouth goalkeeper Asmir Begovic and Everton striker Aidan Downes on loan until the end of the season. 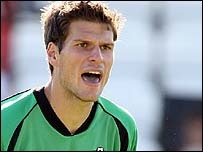 Bosnian-born Begovic was on loan at Bournemouth earlier in the season, and recently impressed for Canada at the FIFA Under-20 World Cup. He has joined Russell Slade's side after after Crystal Palace recalled Scott Flinders. Ireland under-21 international Downes joined Everton's academy in 2005. Russell Slade told BBC Somerset that 6ft 5in Begovic will find it tough replacing Flinders, who he understands will be loaned to Blackpool with a view to a permanent sale. "We don't want to stand in his way and we can't anyway because he's a Crystal Palace player.". "We thank him for what he's done, he's been really steady for us since we came here."